Back in the days BC (before compounds) I would agonize over arrow flight and penetration. A traditional bow is inherently a lot more difficult to match to an arrow than today’s modern, high performance cam bows. After I had switched to modern gear two years ago, I basically gave myself a vacation from the constant torment of achieving perfect arrow flight with arrows of sufficient weight. That vacation officially ended this month. I am booked on a very dangerous game bowhunt in August. There are 5 animals which have been my lifelong dream to bowhunt; Brown Bears, Grizzlies, Leopard, Lion, and Cape buffalo. With the leopard and Grizzly in the bag, and having three unsuccessful Brown Bear bowhunts behind me, I decided to focus 2006 on Cape buffalo. After a long and arduous task of finding a reputable outfitter who is experienced with bowhunting for Buffalo - and who had an opening in a short timeframe (this year) I finally found a good one and booked the hunt. With the outfitter and logistics settled, my thoughts turned to equipment. Unlike many of the animals I’ve shot before (grizzly, moose, etc.) the Cape buffalo is by far the most critical in terms of equipment. I’ve heard all the stories about how their ribs are overlapping, and they weigh 2000 lbs, etc., etc. But how much is too much? And can my ultra-efficient bow-arrow combination do a good enough job? My goal was to test a number of combinations of arrow weights and broadheads and then pick one for the last six weeks of intensive practice. 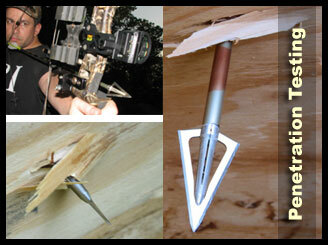 My quest started with broadheads. This part of the equation was very easy for me and it started back at the ATA trade show. I met with Fred Eichler from Easton’s TV show. Fred had successfully hunted lots of big, dangerous game with his favorite head, the Muzzy Phantom. I then met with Fred Settles, COO of Muzzy to discuss the new Phantom for 2006 - the Phantom SS (SS for Stainless Steel). The head looked tough as hell, weighing in at 200 grains without the inserts, and 220 with them installed. I liked the heavy grain weight and the fact that it was stainless should add strength. But like anything, testing would need to be done first for me to add this to my arsenal. Still, I was pretty sure the head would be one of the strongest heads on the market and that grain weight was just what I was looking for. This was also easy for me; at least the brand was an easy choice. After switching from traditional bows to modern gear, my first modern bow was a Bowtech and it’s been that way ever since. Bowtech needs no introduction on Bowsite and I’ve been shooting one successfully now for two years. But after discussing my upcoming hunt with Margaret Knupp, marketing director at Bowtech, she suggested a new 2006 Bowtech Tribute with a short A2A and in weights up to 100 lbs. While tempted to go for the super-heavy draw weights, I still need accuracy and I don’t like struggling to draw the bow, so I ordered a bow at 80lbs and used that for my testing. If my testing did not fare well, then I could always make it heavier. *actual arrows were Chronographed at Hall’s Archery in Manchester Ct. I performed these tests over the course of 8 days. The tests were performed as a process of elimination. If I could not get the arrow to fly straight, it did not go on to the accuracy portion, if the flight was good, but accuracy suffered, the arrow did not go onto penetration testing, etc. I kept notes and filmed all of my results. Flight Tests - My first test was the flight tests with no penetration testing included. This test was critical to me. 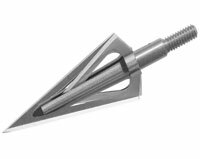 A heavy arrow with high Kinetic Energy will lose penetrating power if the broadhead is not hitting squarely behind the shaft. All the energy should be directly behind the broadhead. Poor arrow flight will divert energy away from the point and that energy will work against forward momentum and that greatly diminishes penetration. This test was performed by simply recording the arrow flight from my 4 test arrows. I filmed the flight using my new Panasonic HVX200 HD camera which can shoot High Def at 60 progressive frames per second. This is twice the speed of a normal video camera and 3 times the speed of a typical movie camera. When viewed in slow motion, the results were inconclusive except for one difference. On my two heavy arrows, my 4-fletch flew slightly better than my 3-fletch with no loss in feet/per/second (FPS) speed for the first 20 yards. (Side note: I had no intention of testing a 4-fletch arrow, I had simply configured my fletching jig incorrectly and by the time I realized it, it was too late. So I finished off my first heavy arrow as a 4-fletch and corrected the mistake for my second heavy arrow). Conclusion - All four arrows flew well with no significant vertical porpoising or horizontal movement detected. The Gold Tip weighting system created a more difficult arrow to tune, but I was able to find the sweet spot. Once tuned, any of the four arrows, even the heaviest arrow flew very well. 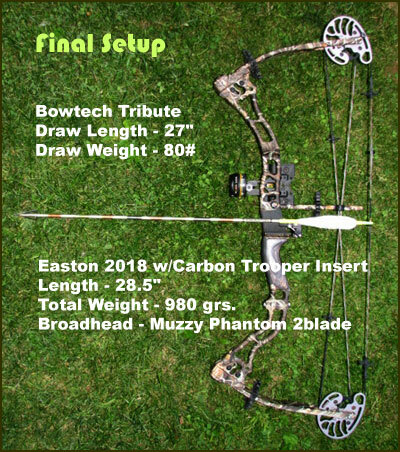 Accuracy Test - this was a lot more difficult to judge, and it required constant tuning, setup and attention to my rest/spine as well as sighting in my bow with every test. But the results were conclusive. I am more accurate with a lighter arrow setup after 25 yards. But within 25 yards my shots were generally within a 3” circle every time regardless of the arrow. The heavy arrows created a steep trajectory curve that increased dramatically after 30 yards. If I was asked to make a 40 yard shot on a buffalo, then this test would be over, but since I am not a long-range shooter, and my PH feels confident that a 20 yard shot was achievable, I kept my heavy arrows in the mix and moved on to the final penetration testing. Conclusion - Within 25 yards accuracy was acceptable for all arrows. Given the fact that my accuracy with the lighter arrows was improved, and the Gold Tips produced less KE than my lighter arrows, I decided to eliminate the Gold Tips from my penetration tests. 2-Blade Penetration Testing - With 3 of 4 arrows still remaining, the ultimate test was to see how well my arrows would penetrate when shot into a fresh sheet of ¾” thick plywood. 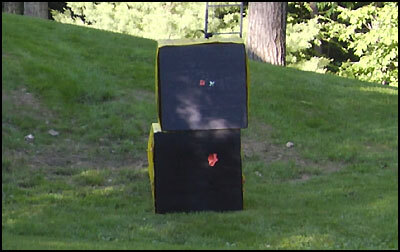 All shots were performed at 15 yards into a fresh section of plywood. This was important since structural cracks from one test could influence subsequent tests. For that reason I shot at least 3 arrows within each test. How Tough is Plywood? Check this out! The results were dramatic immediately. 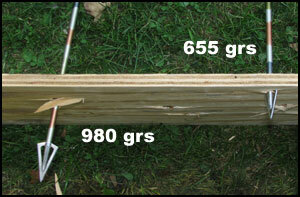 The 980 grain 3 and 4 fletch completely penetrated through the plywood in all tests and gave me a statistical confidence level since all penetrations were between 4.5” - 6.2” of penetration beyond the opposite side of the plywood. The lighter arrows never fully penetrated the plywood and would become lodged into the wood requiring us to drill them out. Conclusion - The heavy arrow had dramatically better penetration than the lighter arrow. The lighter arrow has been eliminated. 4-Blade Penetration Testing - With no discernible difference between the 3 and 4 fletch arrows (arrows 1 and 2) the last test was to see the difference between a 2 blade vs. a 4 blade broadhead. We achieved this test by using a fresh Muzzy Phantom only this time we left the additional 2-blade inserts attached to the head where previously we had remove them. This changed the weight slightly from 980 grains to an even 1000 grains and lowered the speed to 183 fps for a total KE of 74, down 1 ft. lb from our 2-blade setup (statistically insignificant). 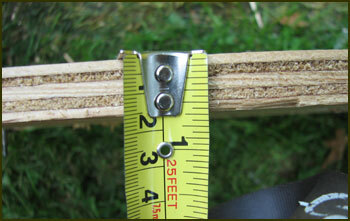 The tests were conclusive immediately - the same arrow shooting a 4-blade Muzzy Phantom never penetrated the plywood. Basically, we achieved the same level of penetration with our light, 2-blade arrows as we did with our heavy 4-blade arrows. Conclusion - the heavy arrow shooting a 4-blade configuration dramatically reduced penetration compared to the 2-blade head. 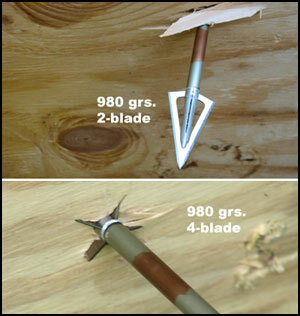 Penetration difference between a 2-blade and 4-blade broadhead? - The results were dramatic, the 2 blade out-penetrated the 4 blade every time by a wide margin. In fact, the 4 blade results were the same as the 2-blade, light arrow results. How well did the heavy arrow penetrate? - in the 2-blade configuration, the heavy arrow penetrated well with our 80lb bow, however not in the 4-blade configuration. How well does the lighter arrow penetrate? - Poorly, it was eliminated as an option. What type of arrow flight can I achieve with my test arrows? - Acceptable with all our test arrows after tuning. Interestingly, the 4-fletch achieved better flight than the same arrow with a 3-fletch configuration - with no speed loss within 20 yards. What type of accuracy can I achieve with my test arrows? - All arrows were acceptable given my personal abilities until 25 yards, after that arrows 1 and 2 decreased my accuracy and at 40 yards the results were dramatic. The arrow configuration which we chose for our upcoming Buffalo hunt is the Easton 2018 with a Carbon Trooper Arrow glued inside the shaft. 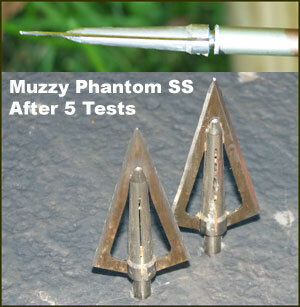 The Broadhead will be a Muzzy Phantom SS (2-blade) and the arrow will be fletched in a 4-fletch configuration. Kinetic Energy - 75 ft/lbs.